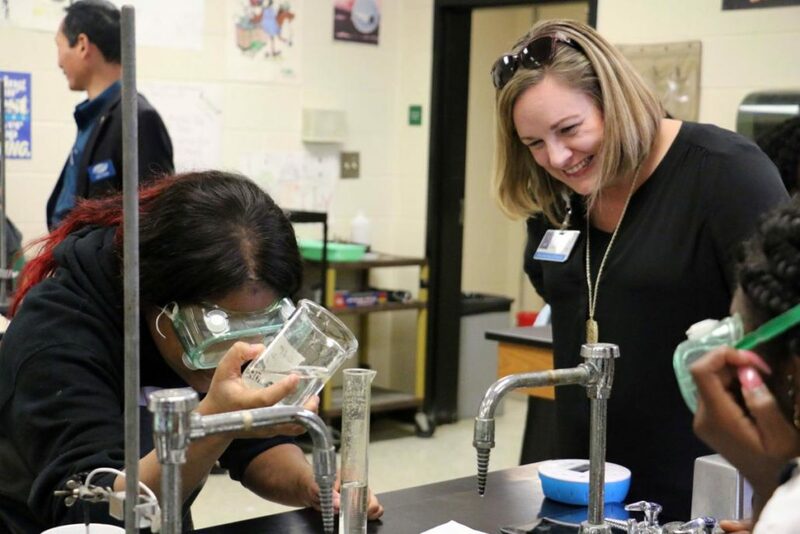 FLORENCE, S.C. – During the Fellows in Education’s visit to West Florence High School, Principal Matt Dowdell shared the school’s plans for implementing more STEM classes and Advanced Placement (AP) courses starting next fall. The addition of the classes will allow students to graduate with a STEM or AP Capstone diplomas. Dowdell, who’s in his first year as principal, said one of his focuses this year is increasing academic rigor, which will create new AP classes, such as government, economics, computer science and psychology, and STEM courses, such as biology, English, geometry and world history. The additions to the AP program will also give students to take part in research. In addition to increasing the academic rigor at West Florence, Dowdell said, the administration has begun to take a more hands-on approach with students and build relationships with them, to better support them and teachers. During the fellows’ visit, they viewed classes across different subjects, including English, journalism and three science-based Project Lead The Way classes, where they got to see students performing lab activities and creating the school newspaper, Knight Life. Joe Edick, who is a fellow, saw the need for funding the newspaper and decided to offer free printing through his company, M&M Graphics. Tiffany Straus, the director of community relations at HopeHealth, also volunteered to help through purchasing advertising with the newspaper. Straus said she thinks it is important to invest in the school district. The next Fellows in Education meeting will take place at Savannah Grove Elementary School on Tuesday, Jan. 8.